The ChrootEveryone setting will make PureFTPd chroot every virtual user in his home directory so he will not be able to browse directories and files outside his home directory. The CreateHomeDir line will make PureFTPd create a user's home directory when the user logs in and the home directory does not exist yet. Make sure that you replace the string ftpdpass with the real password for the MySQL user pureftpd in the line MYSQLPassword! Please note that we use md5 as MYSQLCrypt method, which means we will store the users' passwords as an MD5 string in the database which is far more secure than using plain text passwords! Now open your FTP client program on your work station (something like WS_FTP or SmartFTP if you are on a Windows system or gFTP on a Linux desktop) and try to connect. As hostname you use server1.example.com (or the IP address of the system), the username is exampleuser, and the password is secret. 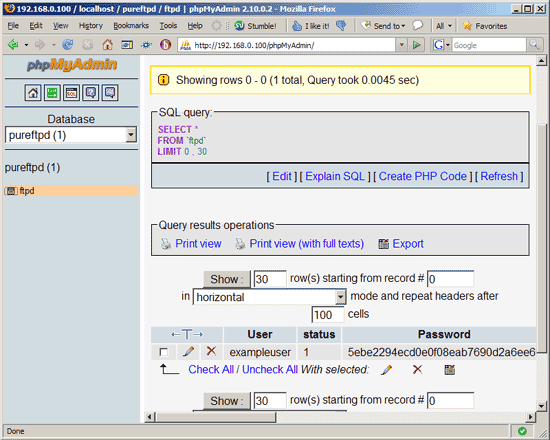 For most people it is easier if they have a graphical front-end to MySQL; therefore you can also use phpMyAdmin (in this example under http://server1.example.com/phpMyAdmin/) to administrate the pureftpd database. User: The name of the virtual PureFTPd user (e.g. exampleuser). status: 0 or 1. 0 means the account is disabled, the user cannot login. Dir: The home directory of the virtual PureFTPd user (e.g. /home/www.example.com). If it does not exist, it will be created when the new user logs in the first time via FTP. The virtual user will be jailed into this home directory, i.e., he cannot access other directories outside his home directory. ULBandwidth: Upload bandwidth of the virtual user in KB/sec. (kilobytes per second). 0 means unlimited. DLBandwidth: Download bandwidth of the virtual user in KB/sec. (kilobytes per second). 0 means unlimited. comment: You can enter any comment here (e.g. for your internal administration) here. Normally you leave this field empty. ipaccess: Enter IP addresses here that are allowed to connect to this FTP account. * means any IP address is allowed to connect. QuotaSize: Storage space in MB (not KB, as in ULBandwidth and DLBandwidth!) the virtual user is allowed to use on the FTP server. 0 means unlimited. QuotaFiles: amount of files the virtual user is allowed to save on the FTP server. 0 means unlimited. If you want to create an anonymous ftp account (an ftp account that everybody can login to without a password), you need a user and a group called ftp. Both have been created automatically when you installed the pure-ftpd package, so you don't need to create them manually. However, ftp's homedir is /var/ftp by default, but I'd like to create the anonymous ftp directory in /home/ftp (the normal users' ftp directories are in /home as well, e.g. /home/www.example.com). But of course, you can use the /var/ftp directory for anonymous ftp, if you prefer it. Anonymous users will be able to log in, and they will be allowed to download files from /home/ftp, but uploads will be limited to /home/ftp/incoming (and once a file is uploaded into /home/ftp/incoming, it cannot be read nor downloaded from there; the server admin has to move it into /home/ftp first to make it available to others).